Gary Sinise’s last TV series, CSI: New York, lasted for nine seasons. Will he be as lucky with Criminal Minds: Beyond Borders?. The TV show had mediocre ratings in its first year but it was renewed for another mid-season run. Will the series be cancelled or renewed for season three? Stay tuned. 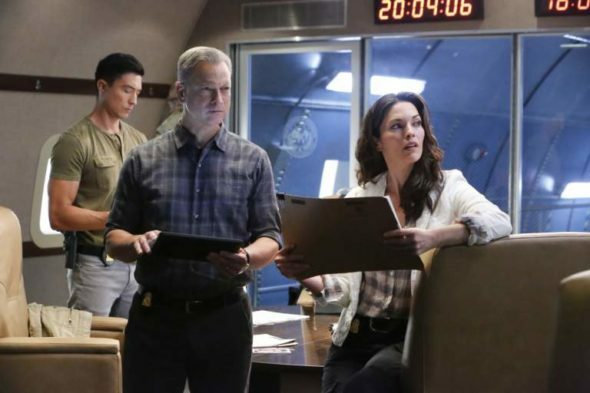 Airing on CBS, Criminal Minds: Beyond Borders stars Gary Sinise, Alana De La Garza, Daniel Henney, Tyler James Williams, and Annie Funke. Sherry Stringfield, Brittany Uomoleale, Kelly Frye, Ezra Dewey, Declan Whaley, and Matt Cohen recur. The procedural series features the International Division of the FBI which investigates crimes and rescues Americans in peril, abroad. International Response Unit Chief Jack Garrett (Sinise) is a 20-year veteran of the Bureau. His crack team includes multi-lingual cultural anthropologist Clara Seger (De La Garza). There is also military hero and expert profiler Matthew Simmons (Henney). Russ “Monty” Montgomery (Williams), is a gifted tech analyst who additionally works with the families of those in trouble. Finally, there is the funny but fierce medical examiner, Mae Jarvis (Funke). The unit zealously works to bring U.S. residents safely home, by profiling and identifying criminals who are beyond our borders. 5/18 update: You can see the rest of the latest night’s ratings. For comparisons: The first season of Criminal Minds: Beyond Borders averaged a 1.24 rating in the 18-49 demographic with 6.92 million total viewers (live + same day ratings). What do you think? Do you like the Criminal Minds: Beyond Borders TV series? Do you think it should be cancelled or renewed for season three on CBS? 5/15 update: CBS has cancelled Criminal Minds: Beyond Borders. Details here. Criminal Minds: Beyond Borders: CBS Season Two Renewal Coming? SICK TO DEATH OF REALITY TV! This show is very Unique & Educational for people who travel overseas! It shows how dangerous it can be in real life! Its not just another Cop show! LOVE!❤ Gary Sinise & the rest of this GREAT Cast! They work well together, they truly portray themselves like a Real Family! We really NEED this show to be renewed! Why would you Renew Madam Secretary, MacGyver, Hunted, & Survivor, over Criminal Minds: Beyond Borders! Especially Madam Secretary, the Rating Numbers were just a few digits apart! That NEEDS TO GO! Instead of CM:BB! I like the show. I love both Criminal Minds shows. Please keep this one also. There are very few shows anymore that I enjoy watching. Love this show and the cast. Please renew. It deserves another season. Do not cancel! This show deserves another season! Why aren’t my posts showing up on here? Also want to add, Gary Sinise is such a great actor, show offers different favors from different countries & cultures! Daniel Kenney is so good looking & pretty good actor too, the entire cast deserves another season! Renew! I just started watching & DVR’ing this show 3 weeks ago & love it so far! However, I don’t usually watch it until 3 days or even one week after original airing as I DVR most of my other favorite shows & I don’t always have time each day to watch all the DVR’d shows. But I think CM:BB should definitely be renewed, I sure hope so! !